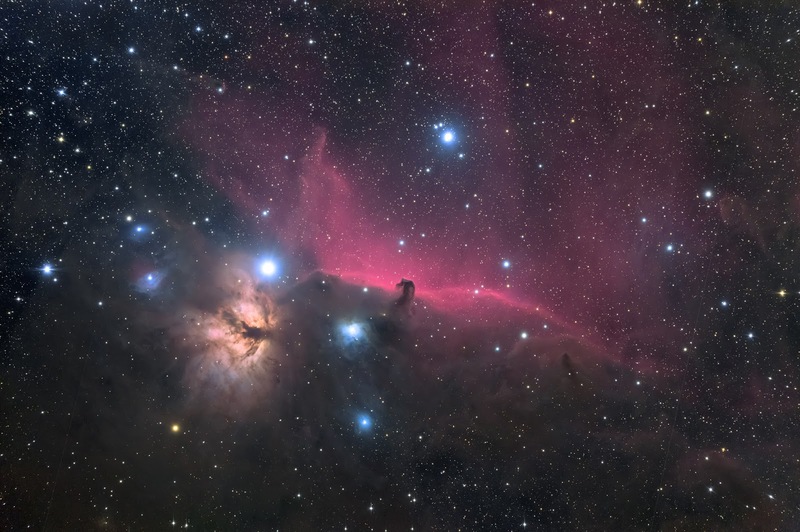 Astrophotography - a beginners guide. Astrophotography is the term used for photographing astronomical objects and large areas of the night sky. As well as the larger astronomical objects (The Sun and the Moon) there are the planets, stars and other objects invisible to the naked eye such as dim stars, nebulae and galaxies. Photographing these very dim or invisible to the naked eye objects can be accomplished by using a long exposure, as digital cameras are capable of accumulating / adding light photons over long periods of time, or using a very high ISO setting and a short exposure time. Use a long exposure on a tripod mounted camera, and you will get shots which show the rotation of the earth as with the earth constantly rotating this will produce a 'trail' effect. To eliminate this effect you will need equipment that will rotate your set-up in the opposite direction to the apparent movement of the stars overhead (diurnal motion) - this can be accomplished with either an equatorial or computer controlled altazimuth telescope mount to keep celestial objects centred while the earth rotates. For moving objects such as comets then an additional guide unit is required to compensate for the objects movement. After all this, you might think Astrophotography is beyond you - but you would be wrong. 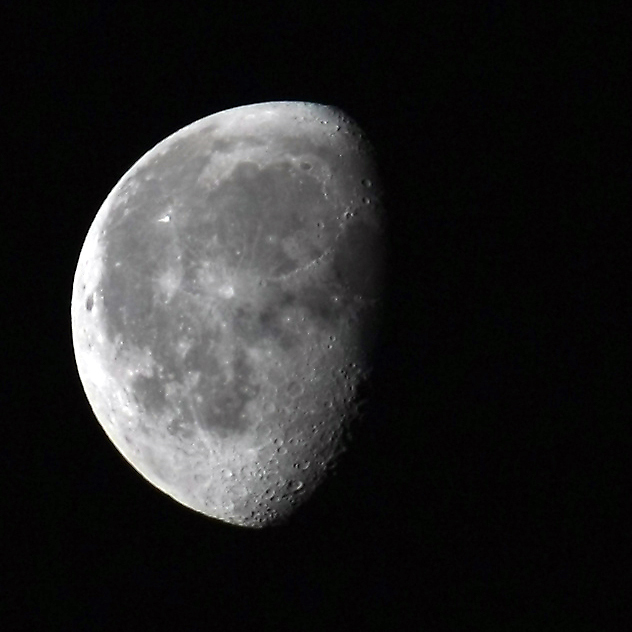 Taking images of the moon you need to use a lens around 300mm or longer and we suggest you spot meter off the moon surface - you will be surprised at just how short an exposure time you need - around 1/250th @f5.6 should be about right using ISO 400. A tripod when using a long lens would be very useful even with a fairly fast shutter speed and check your images as you shoot to make sure you are retaining the detail you require. Basically any camera attached to a tripod and capable of long exposure times can be used to capture star trails and images of the moon can be captured with any camera with a reasonably long lens - the longer the better. Read more about how to take great pictures of the moon. The best conditions for capturing beautiful images of the night sky are clear skies with low light pollution. You need to find an area well away from brightly light areas such as towns and low activity in the atmosphere from winds and moisture. Ideally little or no moonlight (unless your subject is the moon!) as the moon could outshine the celestial objects you are trying to record. Trial and error is the key - start off with a wide to normal focal length lens and focus on infinity. Try an exposure of say 30 seconds at f5.6 and see how that looks in preview. Adjust your exposure time and/or aperture until you achieve the effect you are looking for. You could also set up with a building or landscape in the foreground and allow this to 'burn in' to your image to add interest. Again trial and error is the way to go here. A cable release or remote control for your camera is essential to prevent camera movement - some models will allow you to control your camera from your smart phone or tablet too. This method will also work for subjects like the crescent moon setting in the twilight, or photographing the Milky Way or if you are lucky enough to be in a suitable area the Aurora. 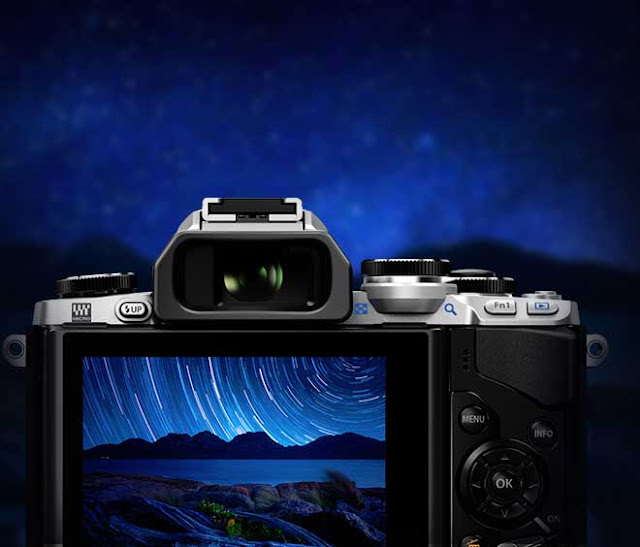 Some Olympus models (including the E-M5, E-M5 II, E-M1 and E-M10) offer a live-timer mode which takes the guesswork out of long exposures by allowing you to open the shutter and then review the image as it builds up on the rear screen of the camera or remotely using a smart phone or tablet computer. When you are happy with the image captured just end the exposure and the image will be saved. To find this feature go to the 'gears' menu, select the Exposure (EXP) setting, go to page two, and select Live Time, you will see the option for how quickly you want the display to update during the exposure - the default is 0.5 seconds but you can alter this all the way up to every 60 seconds if you are doing a very long exposure. So, to capture the light trail effect it is relatively straightforward to do with conventional cameras and requires no expensive extra equipment. To capture stars as pinpoints of light we need to use a more specialised model and either use a high ISO setting to get a short exposure time or use a mount for our camera which tracks the object as already described or attach our camera to a telescope which has a heavy-duty polar aligned equatorial mount. An equatorial mount allows the camera attached to the telescope to be set parallel to the earth’s rotation, this is then combined with a clock-drive operating in the opposite direction to counter the earth's spin and freeze your subject - allowing long exposures without movement. It goes without saying (but we will say it) a very sturdy tripod is essential to prevent any wind movement - you can weigh your tripod down with weights or a camera bag to increase stability. A lens hood will also be very helpful in cutting out any extraneous light and preventing dew forming on you lens. In-Camera noise reduction for long exposures can also be useful as this exposes a blank frame (usually after the main exposure) which records any noise present and then deducts this from your final image. Recent advances in camera technology have provided us with models with ultra-high sensitivity and low noise. Noise is the arch enemy of the astrophotographer so select a camera model which has excellent low light capabilities - such as the Sony A7s which is a model specifically targeted at low light work. A really good bridge-camera for this type of work (or anything else) is the Panasonic DMC-FZ1000 or the Leica V-LUX typ 114. Both offer a great lens range of 25-400mm equivalent with fast aperture, and a large (for a compact camera) 1" 20mp sensor. As a starter SLR, the Nikon D3300 takes a lot of beating as it has excellent high-ISO performance combined with excellent levels of detail from its 24MP APS-C sensor. The new Canon EOS 760D also offers very good low light performance and gives you access to the full EOS range of lenses. The Sony A7s features a 12.2MP Full-Frame imaging sensor with truly phenomenal sensitivity with ISO settings up to 409,600 available, combined with a high-speed BIONZ X processing engine for rich tonal gradations and low noise. The A7s is also easy to use with a huge range of lenses from both Sony and via adapters virtually any lens produced can be fitted. 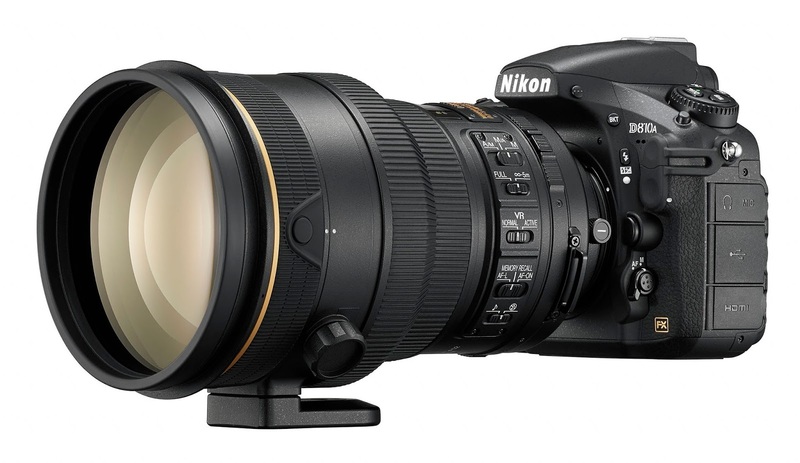 For the committed Astrophotographer Nikon produce a model specifically designed for the job - the Nikon D810A. This model has been specifically designed with a special Infra Red cut filter for long-exposure deep-sky astrophotography. Based on the award winning D810 the D810A records the brilliant red tones of H-Alpha emission nebulae with fantastic levels of detail and sharpness and 4x better contrast than a conventional model. With a superb dynamic range and rich tonality the D810A can produce noise-free results up to ISO 12,800 with exposures up to 15 minutes long. ISO expansion up to 51,200 is also available allowing short exposure times of the faintest objects. The D810A also has a long-exposure manual mode allowing you to set exposure times of 4, 5, 8, 10, 15, 20, 30, 60, 120, 240, 300, 600 and 900 seconds in addition to bulb and time modes. The D810A can also take advantage of the astrophototography noise reduction feature in Nikon Capture NX-2 software which will reduce the noise in photographs of stars and constellations without wiping out the pinpoint stars you are trying to capture. If you like shooing at Night or Low Light, and want more photo advice, purchase the Night & Low Light Photography guide which not only features tips and tricks, but also includes a pull-out quick reference guide to assist you. 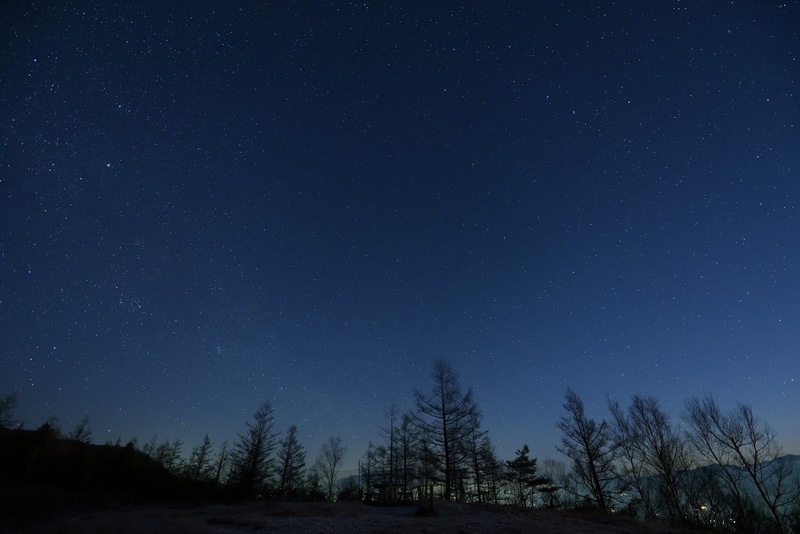 If you have any questions about how to photograph the night sky, please write in the comments box below and we’ll do our best to answer them for you.